This is sure not to be missed. 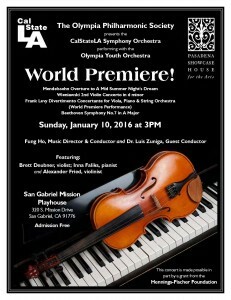 Sunday, January 10, 2016 at 3PM at the San Gabriel Mission Playhouse, 320 S Mission Drive, San Gabriel, CA 91776. Admission FREE. Program to include Mendelssohn Overture to A Mid Summer Night’s Dream, Wieniawski 2nd Violin Concerto, Frank Levy Divertimento Concertante for Viola, Piano & String Orchestra (World Premiere Performance), and Beethoven 7th Symphony. You are currently browsing the Olympia Philharmonic Society weblog archives for the month December, 2015.